First off this week, what an amazing abundance of fresh flavors this week. I am surrounded by yummy foods everyday and still there are times (like this week) when I am in awe of the flavors of the season. Truly a great celebration for the 4th of July. I wish you all a safe holiday. 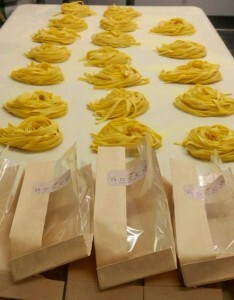 Secondly, a new product offering that I am really excited about, fresh pasta. I know very few people who subsist on straight veggies. Most of us need something to go along with our pile of veggies. Last year we introduced the pizza dough. Huge hit. Kids and grown ups alike go crazy for high quality pizzas made at home. So this year we want to build on that with a fresh pasta that cooks in 3 minutes. Fortunately, in our search to bring you the best food, we met Alanna Casale, who was in the midst of launching a new pasta company, ñocco. She is now in production and we are happy to offer them to you. I encourage you to try some out. Check the web site for more info and to order. Now on to some long term vision planning that we have been having around the farm trying to answer the question of what will our/your farm look like in 5 to 10 years? We have worked like heck to be a presence in the local food scene over the last 12 years, now the time has come to really fine-tune the work we do. Be laser focused with all of our energies instead attacking the world like a blindfolded dude in a pinata shop after a 6-pack. And no good vision quest for the future would be meaningful if we did not take an honest assessment of where we are now and how we got here. And the key word being honest. Sure we have to acknowledge our triumphs and what is working well for the farm. But we also have to ask ourselves what mistakes we made or continue to make currently. Without both sides of this coin, planning for the future is a pointless endeavor. Honesty must lead the way. Looking at our list of the Good and the Bad/Ugly, the good looks great. We grow really amazing food. Take care of the earth that our community calls home. 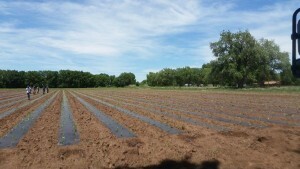 Are water efficient farmers. Raise healthy happy animals. And have the most dedicated group of farmers and employees that you could find anywhere. Furthermore, we are able to do all of that while making money and not being a burden through grants or the non-profit world. Which is no easy feat. Now to the list of Bad/Ugly. The list has just one word in it, LAND. Let me explain here. In 2008, the farm was not even in kindergarten yet and had seen just huge growth in the demand for local food over our first 4 years. We had already outgrown our land in the North Valley and had outgrown a greenhouse nursery complex we bought off Edith. In all honesty, I was freaked out that the demand for our food was growing faster than our ability to keep up. So under that pressure, we bought our South Valley farm of 16 acres. We finally had space to grow and room to breathe. I was a happy camper. Fast forward to today. We need a lot more space than 16 acres to keep food on your plate, but I am realizing that we do not have to own the dirt. We have so many options and opportunities to farm throughout the valley, that I have realized that owning the farm is just not necessary. Not only is it not necessary, but it is an expense that we just do not need. Owning land is risky and expensive. Leasing land is flexible and cheap. So I have made the decision to put the farm land up for sale in order to put our money into farmers and not the land. Finding land is easy, finding great growers is hard. We will have more resources to put towards building a better team. Over the years we have heard a bunch (no pun intended) of requests to bring in bananas. So we found a great grower in northern Mexico and started to offer them. In the first few weeks, 25% of all orders added bananas. So we knew the demand was there. But then there is the sticky part, bananas are the ONLY thing in our offering that cannot be refrigerated. They turn black. So how do we create a completely new system for just one product? The answer is that on paper it worked out great, but in practice was another story. The bananas would come in at various levels of ripeness, we could not refrigerate them, and our ability to consistently deliver perfect bananas to our members was close to impossible. So I have to wave the white flag of surrender and let this item go. I apologize if you have been counting on these being a part of the box, but I want to set up systems to succeed and the bananas were a far cry from being able to succeed. Another Harvest Box note that I want to mention is the surcharge items that we have added in the box. For the most part, we are able to provide a really nice fresh CSA box to you every week of the year for the standard $30/36/42 price of the Harvest Boxes. We can make things fit fairly well into that structure and all works out. Well what happens when summer hits and we have growers with cherries, blueberries, strawberries, etc.? Those items, as anyone who goes to the store or markets knows, are more expensive and more of a seasonal splash rather than a staple. So being in charge of your produce happiness, I come to a crossroads—don’t offer these items because they are more expensive, or ask you to pay a small surcharge to bring all of the flavors of the seasons to your box. As an example let’s look at strawberries. We can get you twice the strawberries in your order for just over $1 more to your cost. So we could get a smaller berry package that fits the normal cost of the box, or twice as much for $1.Last summer we dipped a toe in this water and trialed it when the cherries were in season. And folks got it and liked it. More fruit to enjoy for a small amount extra. And this is just one example of the many. As consumers, we get better value when you buy more. Hence, Costco will sell you 1,000 rolls of toilet paper when you clearly only need 975. The produce world is the same. So when things are in season and they are at the height of their quality and flavor, I want to enjoy them. I want you to enjoy them. So I will ask you to pay a bit over the norm to enjoy some products that are out of this world. Lastly, you can remove any of these items from your order and keep the usual Harvest Box price. Thanks for understanding. From there and seeing how we are upon the summer solstice, let’s take a look at how the CSA is shaping up to look this summer. For me, the CSA boils down to one word in the summer, raw. We have fresh produce all year, but the summer is the time when we tend to eat raw. Our ovens shut down until Balloon Fiesta and we try to take the heat from our kitchens and move them to the grill outside. Seeing that trend, I try and make sure the Harvest Boxes mirror that tendency to eat raw. Very few items need to be cooked. No grill would be complete without the smell of onions and oven roasted potatoes, but other than that, we try to keep it cool and fresh. Another primal tendency takes over too in the summer and that is being on the run. We nest in the winter months and fill our homes with smell of a crock pot. In the summer, we are on the go. So having fresh fruits, sliced carrots, and cucumber and tomato salads fit our lifestyles. Cheers to the longest day of the year and to a truly magical time to be enjoying the abundance that Mother Nature gives us. We will try to keep up with your busy schedule this summer, and you amigos, stay hydrated and hungry. uick produce note: the end of the season for Arizona grapefruit is in sight. So what does that mean? Well, it means that this fruit has been sitting on the trees for several months soaking up the rain and sunshine that the desert has enjoyed this spring. And as grapefruit relax on the trees, the acids turn into sweet sugars. So if you like to make the tequila face when you eat a grapefruit, these guys are not for you. But for me, the increased sugars with just a hint of that acid bite is my Goldilocks zone. I encourage everyone to put away those grapefruit spoons and eat these guys like you would an orange. Peel and scarf. We should have them for 2/3 more weeks. Enjoy. Second note is that the desert grapes from the border of Arizona and California are kicking into gear right now. These are some of my favorite grapes because the intense heat of the desert make for a very sweet grape that is not diluted down with a bunch of water. You will really like these grapes I think. I know I do. Last produce note since I am on a roll, the California drought. I have noticed something this year that has been different than seasons past with the early season California nectarines and strawberries, they are amazing. Now they usually are pretty good, I will give them that. But this year has been exceptional, why? I was recently talking to a friend of mine who is neck deep in the produce world in California and mentioned the quality of the fruit to her. Her take is that since water is more scarce, growers are forced to use less water. Makes sense. When that happens, the trees will put out smaller fruit but with more intense flavors. As a visual, picture it like this. A tree is a giant solar panel with all of its leaves collecting energy. All of that energy is stored in batteries that we like to call fruit. So when the tree does not have a lot of water to grow bigger fruit (batteries), the tree stores the same amount of energy in a smaller fruit. Therefore the fruit has a smaller size, but it has all of the flavor and less water of the larger fruit. So when we look for fruit for you (and ourselves), we never want the giant fruit. The giant fruit has usually been pumped with water that increases the yield for the grower, but dilutes the flavors for the consumer. Rule of thumb amigos, in the produce world, size does matter. You will be happier eating more of the smaller fruit than the larger. Additionally, since the general public thinks that the bigger the fruit the better, the price is higher on the larger fruit. Lastly this week, early June marks the 12th anniversary of our CSA launch. Because I love birthdays, I always look at the farm as having 2 a year. 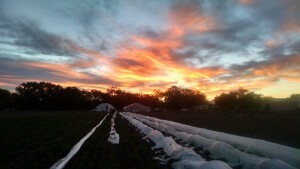 One is the first week of March when we broke ground at the Los Poblanos Ranch. And the second is June 6th, 2003 when we launched a new model and a new way of looking at the local food system. Although this model had been proven in other states, it was the first of its kind in New Mexico. Launching the farm was definitely a test to see what we could grow here in ABQ. But honestly, it was much larger than that. It was a test of the community to see if they would support a small farm with so many existing options for natural and Organic food in place. Fortunately, 13 months into the start of the farm, that question was answered and I knew that I would not need a “day job” in order to make this farm succeed. The final test of this new collaborative model was to find and grow our network of partners. This was not and still is not easy to do. There is a sense that as a person or business we grow from being a dependent and then hopefully become independent. At that point, many feel like you have “made it.” That there is nothing greater than independence. We broke that myopic perspective and realized that the greatest thing to aspire to is actually co-dependence. We need partners and they need us. In this codependent model, an amazing symbiosis occurs. We are better as a group than we could ever be alone. This is a liberating place to find yourself. You don’t have to be everything to everyone. And this goal never ends, always growing and getting better.